Nichole Brown | One major focus of Brown's research is the performance of polyvinyl acetate latex adhesives. Dr. Nicole Brown, Associate Professor of wood chemistry, studies the mechanical properties of wood adhesives and wood composites at the molecular level, as well as the chemistry of wood biopolymers and wood treatments. While adhesives are widely used with wood products, their function is not well understood at the molecular level. Brown's group uses a wide range of analytical tools, including solid state nuclear magnetic resonance spectroscopy (NMR), infrared spectroscopy and dynamic mechanical analysis to investigate the function of both the adhesive and the wood itself in bonding. One major focus of her research is the performance of polyvinyl acetate latex adhesives, commonly available as household wood glues. The goal of this project is to develop a greater understanding of the molecular aspects of adhesive bonding and performance. Many secondary manufacturing operations use crosslinking polyvinyl acetate adhesives to join small clear sections of wood, yet relatively little information is available about these systems. These adhesives are typically made by copolymerizing vinyl acetate with a small amount--less than 5% by weight--of a multifunctional co-monomer. Crosslinking reactions of the co-monomer are thought to provide greater durability to the adhesive. The main objectives of the project are to determine the distribution of N-methylolacrylamide (NMA), the multifunctional comonomer, in the latex and to determine how NMA distribution in the latex correlates with the durability of the adhesive. Among other variables, the research will determine whether there is a performance difference based on placement of the crosslinks at the surface, inside particles, or in solution. Dr. Brown's second research interest is studying the properties, at the molecular level, of biocomposites made of bamboo, wood, plastic, or grass products bound by adhesives. This research focuses on several aspects of composite structure and performance. In addition to determining the species-related performance of different biological materials, Brown is interested in a better understanding of cellulose itself. Ultimately this understanding may lead to novel methods of catalysis and new systems for composite design, including novel wood-plastic composites and nanocomposite materials based on cellulose and lignin. Prior to joining the Penn State faculty, Nicole Brown earned her B.S. in Forestry and Wildlife at the Virginia Polytechnic Institute and State University, Blackburg, VA in 1997 and her Ph.D. in Forestry and Forest Products at VPI in 2004. 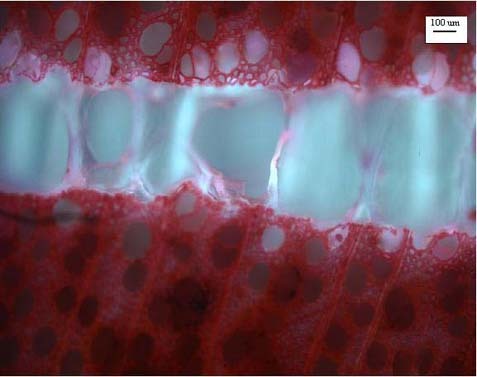 A microscopic view of the wood-adhesive interphase for two pieces of yellow-poplar (stained red) bonded with poly(vinyl acetate) adhesive (clear).